I recommend it all the way!! "It's the first time I use an Audiobook, and I would recommend it all the way! I find it to be a very good resource when learning a language. 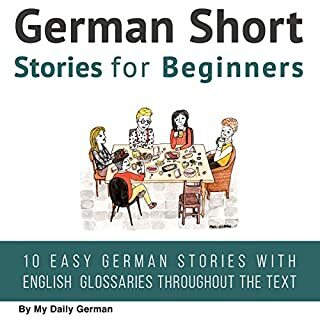 I've been learning German for 2 months now and the Audiobook provided me what classes couldn't: listening passively! The Audiobook helps me to train my listening. I can just push play and listen to the stories while trying to understand the context and words in the train, in the bus or when I just have 10 minutes to dedicate to learning. I come from the Spanish language so it's great to start listening to a really different language like German. It also helps to get vocabulary since it comes with a glossary translation of a good amount of words from every story. I find it useful to listen to the story, go listen the glossary and try to find that vocabulary listening again the story. I would also like to highlight that the Audiobook comes with a PDF to follow the stories and also see and learn how the words are spelled. To sum up, I find it really useful, fun and easy to listen, and good to start learning and practicing a language, even if your knowledge level is still developing. I would definitely recommend it, and encourage anyone who's interested in trying to do so!"